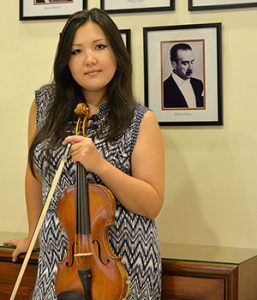 Dina began study of the violin at a very young age, starting at the Specialised Music School Conservatory of Novosibirsk, Russia at 7 years. She went on to music high school and ultimately to the Tchaikovsky Moscow State Conservatory. Dina has participated in a number of music festivals in Russia, France and Italy, and has been awarded diplomas and prizes at music competitions in Italy and Russia. She joined the Symphony Orchestra of India in 2008 and was also a violin teacher in the NCPA music training programme from 2012. Dina joined the Instrument Faculty of MMMF in July 2016.